If you haven’t already added social buttons to your website, now’s a good time to do it. And looking into some of the best social share plugins is a great start! Social media continues to show explosive growth, with 2.46 billion users in 2017. That figure is expected to reach 2.9 billion in 2020. When it comes to boosting traffic to your website, nothing quite does the trick better than social media shares and likes. If you’re using WordPress, there are themes that include a social sharing feature. But if that’s not the case with your theme, you’ll need to pick from some of the social share plugins. These plugins make it a great deal easier for readers to share your content. You’re truly spoiled for choice when it comes to picking from the best social share plugins for your WordPress website. These plugins not only add share buttons and follower counts, they also encourage and monitor social shares on your website. But before you get excited with the tons of features these plugins offer, you need to evaluate them against the specific requirements of your own website. You’ll need to check if the plugin supports the social networks you want, as well as the placement locations. Sure, feature rich social share plugins are a fantastic option. But if all that your website needs is a few basic buttons, there are many simple, lightweight plugins too. Sumo is actually a clutch of tools that goes all out to increase your site’s traffic, shares or signups. The majority of the tools are free, including the Sumo Share. Though you’ll need to install the entire suite, you can activate only the modules that you need. The official WordPress plugin for Sumo makes setup easy, and configuration takes only a few minutes using drag and drop. The interface for choosing display positions can’t get simpler. Sumo gives you total control over the counts and display buttons across 65+ networks on a per-page basis. You can hide individual counts or display counts only over a certain number. 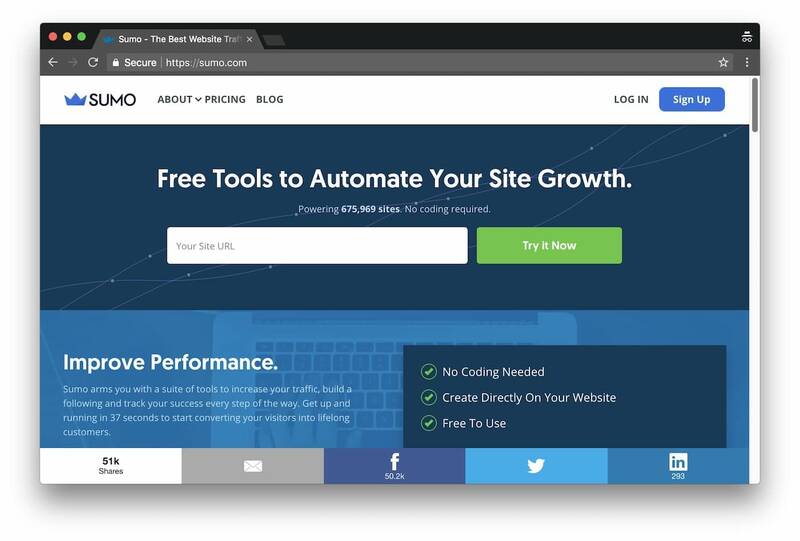 The one feature that stands out in this plugin is the automatic reordering of the mobile friendly buttons by those that receive the most clicks. To remove Sumo’s own branding, you’ll need to purchase the premium version. That one also sets you up with analytics, so you know how and when your content gets shared. You can have different share preferences for mobiles and desktops. While Sumo is a top of the shelf product, it’s not a standalone plugin. It may be a fine option if you intend to combine it with the other tools in the suite to automate your site’s growth. Orbit Fox Companion is a free plugin that bundles a number of modules into one compact plugin. However, there’s no bloat, as you can activate just the modules you need. The sharing and reporting modules are available to all WordPress users, with support for up to 20+ networks. The remaining modules (custom menu-icons and free stock featured images) extend the features of Zerif and Hestia themes. They add widgets and front page sections to your themes. Setting up the plugin is easy. From your WordPress dashboard, you can toggle the sharing options and position of the buttons. You can choose different options for mobiles and desktops, and draw on custom menu icons or stock featured images. The plugin is developer friendly, and you’ll receive automatic updates on your dashboard. The advantage with this plugin is that it will load only if it’s compatible with your existing themes and plugins. 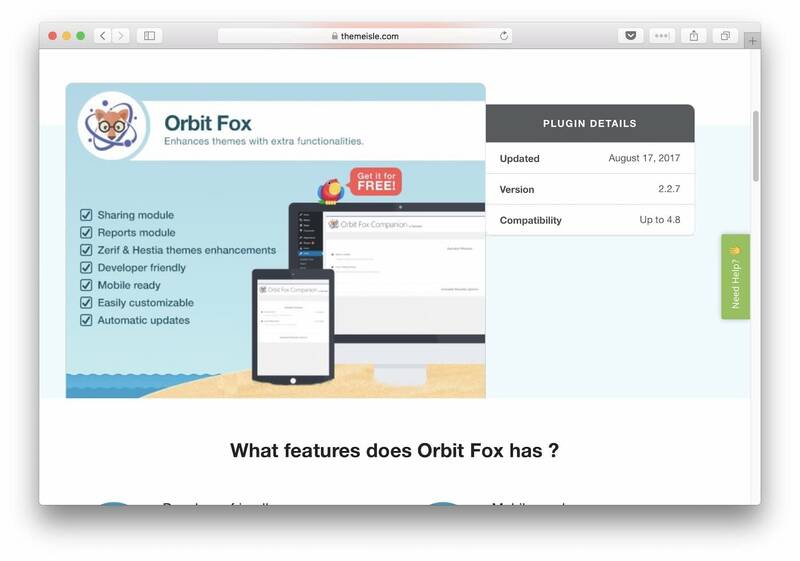 Orbit Fox Companion is an easy-to-use plugin that allows perfect control over the appearance and location of your social share buttons. Another one on our list of the best social share plugins for WordPress, AddtoAny comes with a slew of features, including a universal share button. This button allows users to hover over and get the option to share across multiple platforms, including WordPress. It connects with a 100+ social sites and apps, and includes a WordPress plugin. 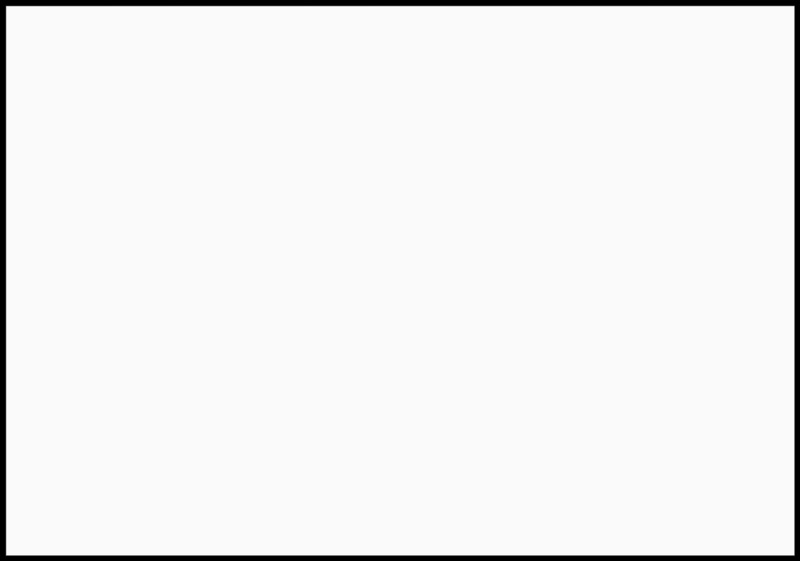 This plugin places simple floating social bars on either side, as well as at the top or bottom of your posts. Besides, users can take advantage of many aids such as email templates, Twitter templates, URL shortener, and more. Without any signup, login or creation of account on your part, AddToAny can display social share count. You’ll be able to change several settings with this plugin. You can adjust the sizes for social media icons, dictate the position, and decide whether or not to include social share counts and more. 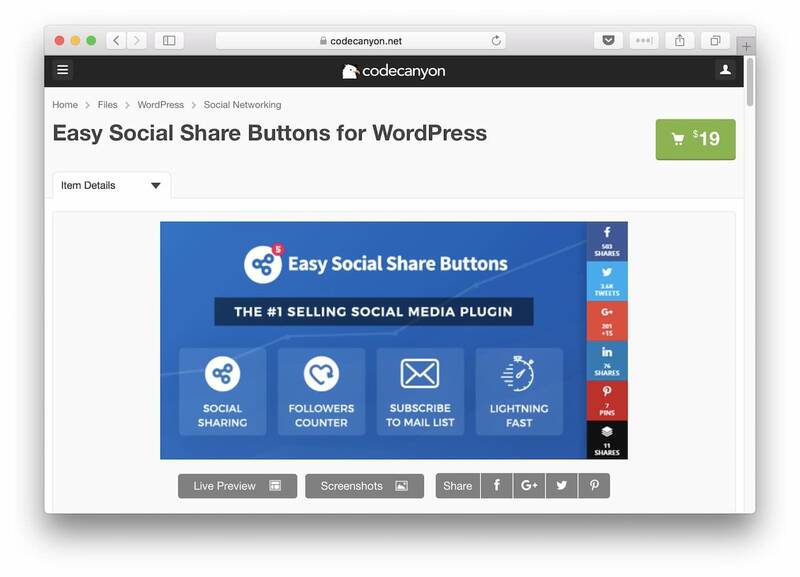 Another plugin that ticks all the boxes is Easy Social Share Buttons for WordPress (paid). It allows you to enable sharing on 45+ social networks and choose from 52 templates. It’s possible to go crazy with customization with this plugin. It offers 27+ automatic display positions and 30+ eye-catching animations. With a single license at $19, it’s a fair bargain. It bundles a host of premium features including sharable quotes, metrics and analytics. Besides, there’s A/B split testing, Facebook Comments, social profile links and more. The plugin also includes functional buttons such as buttons to like, print and email. What makes this plugin a standout is the vast range of options that it offers, all without having to use code. 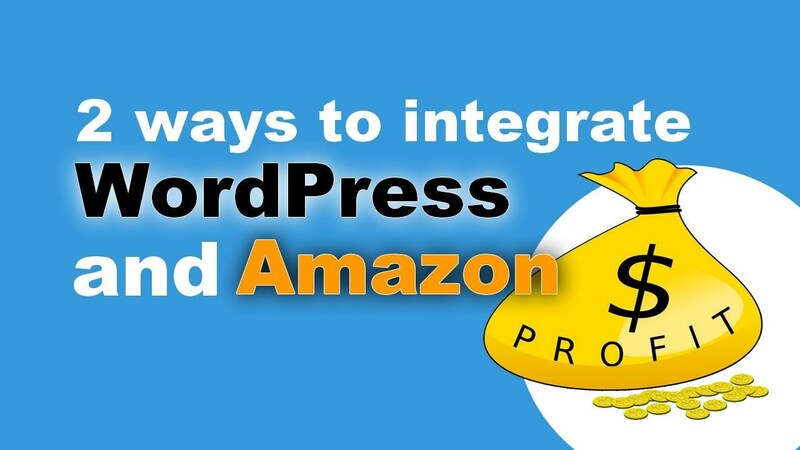 Many features help you set up the plugin in a way that’s optimal for your website. These include different plugin modes, automatic setup for mobiles, automated optimization options and the Undo Changes option. Not everyone wants a fully featured plugin for social sharing. WP Social Sharing can commendably serve the needs of websites that like to go with a straightforward plugin, offering a few basic networks. It’s lightweight, and uses CSS3 to create large, responsive social sharing buttons. If the device width is less than 480px, the buttons automatically convert into their respective icons. Further, the plugin integrates easily with any theme. 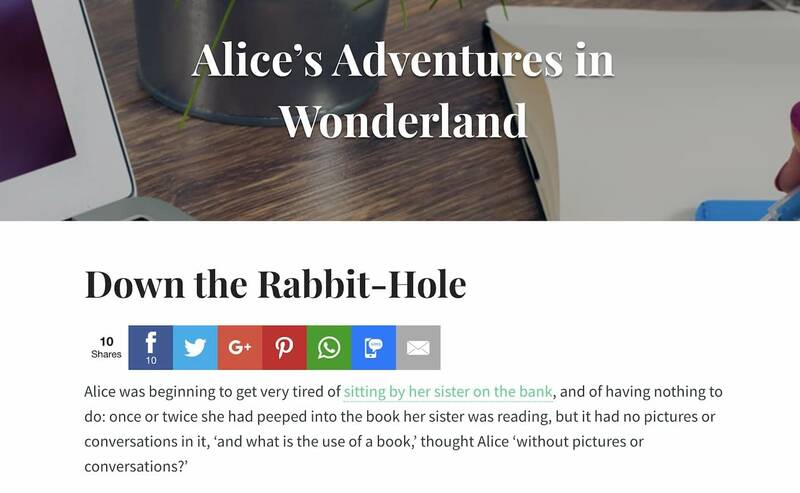 The WP Social Sharing allows you to display buttons on any post, page, custom post type and media. The social icons can be reordered anyway you like. Which plugin is right for me? While all the best social share plugins on this list make the cut, much depends on the specific requirements of your website. Sumo Share offers significant functionality for a free plugin. Moreover, it orders icons by number of clicks. The flip side of Sumo Share is their branding on the free version – which goes away with the most basic pro licence priced at $29 per month. If you want all the features with great control Easy Social Share Buttons for WordPress also gets the nod. But if a wide range of seemingly unrelated features isn’t your thing and all you need is basic social share buttons, you can nail it with WP Social Sharing or Orbit Fox Companion – particularly good if you need an efficient and straightforward plugin that’s mobile friendly. Ideally, social share plugins should form a part of your overall social media strategy. We’d love to hear from you about your experience with social sharing on your website.